BANGKOK, Dec 17 – Hundreds of thousands of residents of northern and northeastern Thailand are suffering from the current cold snap, with many areas having been declared disaster zones. Nakhon Phanom provincial governor Adisak Thep-art said 10 out of 12 districts have been declared disaster zones since the temperature dropped below 15 degrees Celsius during the past three days. Some 100,000 people are suffering from the cold and in need of winter clothing. So far, 20,000 residents have received winter aid. The lowest temperature was recorded this morning at 14 degrees Celsius. Maha Sarakham province in the northeast has also been swept by the cold spell, with temperatures plunging to 6 degrees Celsius since yesterday. If temperatures are recorded below 15 degrees Celsius for three consecutive days, the province will be declared a disaster zone. Up to 200,000 Maha Sarakham residents are expected to suffer from the cold this year. Winter frost today was observed covering the higher elevations of Doi Inthanon, Thailand’s highest point, located in Chiang Mai’s Jomthong district, with the frost temperature recorded at -1.4 degrees Celsius. The overall temperature has dropped sharply by 6-8 degrees Celsius, with temperature in downtown Chiang Mai province recorded at 14.3 degrees Celsius. So far, six districts of Chiang Mai have been declared disaster zones, with 50,000 households affected from the cold. 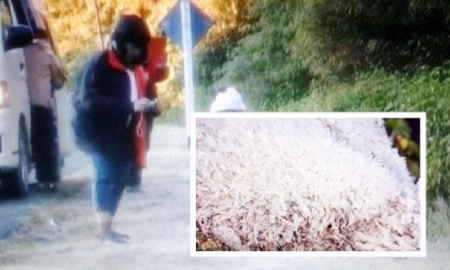 Temperature on Doi Angkhang Mountain peak was recorded at 3.9 degrees Celsius. The disaster office warned those living in the cold-stricken areas to keep themselves warm as the temperature is expected to keep falling. Dropping temperatures in Lamphun province reached 12 degrees Celsius and dropped to 5-9 degrees Celsius on mountain peaks. Residents have been warned to use caution while driving in low visibility and to take good care of their health.